Custom-crafted carousels and trains have been the grand centerpieces for Louis Vuitton shows in the past, but Marc Jacobs has moved on and now added escalators to his repertoire of over-the-top set props. 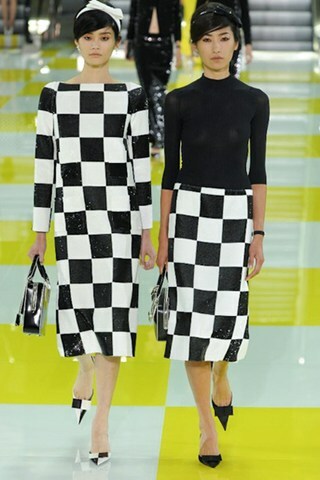 Today in Paris at the Louvre, models descended two at a time from escalators onto a yellow and white checked runway. Like the catwalk, the models wore checkered designs ranging in color schemes from black and white to green and white to yellow and white, similar to the dual-colored stripes on parade a few weeks ago at the Marc Jacobs show. The reigning creative director for Louis Vuitton was inspired by the abstract minimalist conceptual artist Daniel Buren. "His work is very graphic with the use of grids and so I took inspiration from his sculptures and installations," said Jacobs after the show. There is no doubt that the dress lengths, silhouettes, and beehives gave off a 60s vibe, but Jacobs explained otherwise. "I can't seem to avoid a reference when I design," said Jacobs, "But it wasn't meant to be 60s. The beehive hair probably aided that." Louis Vuitton's signature monogrammed "LV" was missing from the clothing this time around, but Jacobs explained, "I didn't want to do the LV monogram for once, so I used the LV Damier squares instead." Jacobs worked his magic once again. I was ecstatic to see Louis Vuitton's new collection first thing this morning, because I recently finished constructing my own peplum top resembling a checkerboard. I spent hours cutting out all the squares and sewing them together. A true labor of love. As the old adage goes, great minds think alike.